If your New Year's resolution is to travel more, now is the perfect time for a quick and inexpensive beach vacation. Year after year, Puerto Rico continues to earn its reputation as "La Isla del Encanto," and with no need for a passport, U.S. citizens can visit its beaches and extensive coastline to escape the winter months for a worry-free beach vacation. With more than 270 miles of coastline to explore, Puerto Rico and its beaches have something to offer every type of traveler. Beachgoers can relax the day away with a swim in the ocean, a catamaran ride and surfing. For the more adventurous traveler, the island's beaches offer an ideal setting for snorkeling and deep-sea diving. Maintain your wellness resolution and say 'Namaste' on the island, as Puerto Rico's beaches are the perfect setting for a breathtaking sun salutation. Travelers can rise with the sun or take a sunset breath to truly get in touch with their inner-selves and the world around them… all while burning a few calories. 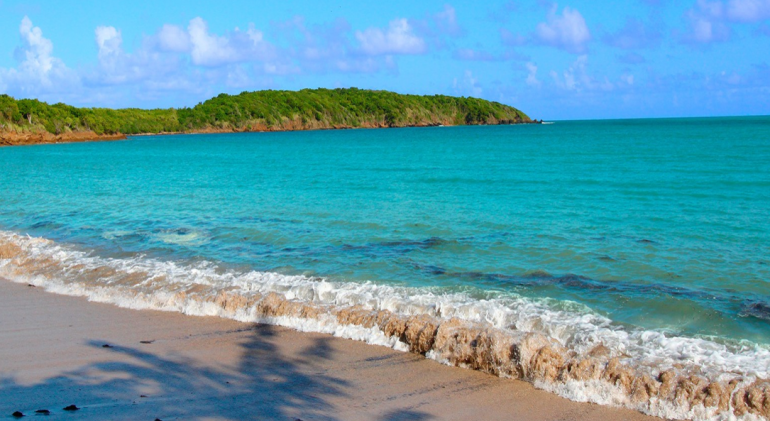 In addition, Puerto Rico is home to numerous blue flag beaches. These beaches are recognized for their water quality standards, safety, environmental education and sustainable boating tourism by the Foundation for Environmental Education. Puerto Rico's blue flag beaches include: Escambrón in San Juan, Carolina Beach in San Juan, Seven Seas in Fajardo and La Monserrate in Luquillo. Ready to save? The Puerto Rico Tourism Company (PRTC) has partnered with popular booking sites, giving travelers the chance to save on their Puerto Rico escape. Travelers can book here and save up to 60% on their hotel stay. For those ready to book a Puerto Rico beach vacation, the following is current information to ensure a worry-free experience! Purchase and use an EPA-registered insect repellent containing DEET, picaridin, oil of lemon eucalyptus (OLE)/para-menthane-diol (PMD), or IR3535. Follow instructions on repellent label and be sure to apply at proper intervals, as directed. When wearing sunscreen, be sure to apply sunscreen first, then repellent once sunscreen has dried. Cover exposed skin with long sleeves and long pants, when possible, especially when traveling through rainforests and around standing water. Keep all balcony doors and windows closed at night. For travel tips and more information about the Zika virus in Puerto Rico, travelers are urged to visit here!